The Surrey Club was one of the earliest clubs running tethered cars, being formed in 1947 and in some ways owed its existence to the activities of the Pioneer Club. 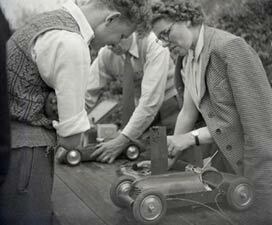 The Pioneer Club was, as its name suggests, one of the first to race tethered cars in a formal and organised way and membership was exclusive and selective. Meetings were held at The Horticultural Halls Westminster and most of the enthusiasts from London and the Home Counties raced there regularly including the Gascoignes, Curwen, Cruickshank, Weaver, Zere, Bowler, C.E. Smith and the Rickards. The only down side of the arrangement was that the track was not permanent and meetings had to fit in with other bookings for the halls, and from this the Surrey Club was born. 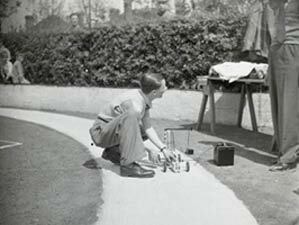 There is no doubt that the ‘Pioneers’ were ‘well to do’ and none more so than Guy Rickard who amongst his business interests owned Replica Models in Sloane Street London, which manufactured parts and supplied kits, engines and accessories for building a range of cars. 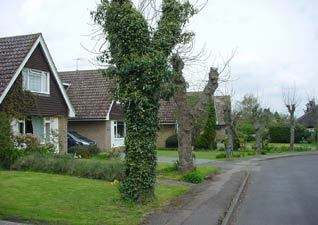 Guy lived with his wife in the hamlet of Beech in Hampshire where he had a private track in his garden. Noise problems prevented this being used for anything other than their own amusement and invited ‘guests’, but only then after services in the nearby church had finished. Guy Rickard was to be one of the prime movers in the establishment of the Surrey Club along with another ‘Pioneer’ C.E. Smith. Smith, who was an engineer, lived in the delightfully named village of Christmaspie, which is just 5 miles west of Guildford in Surrey. He lived two doors away from a local builder called Charlie Cull who was to provide the opportunity for the formation of the Surrey Club. Charlie Cull was a builder and undertaker who had bought a huge tract of land near to Wanborough Station and then built a small commuter village on it. 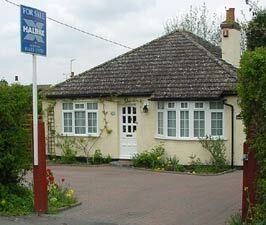 Behind his bungalow was his builders yard and workshops. 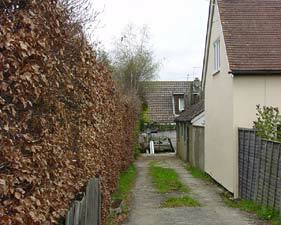 An access road beside the bungalow led past his offices to the yard behind. On spare land that ran from this yard down the side of Christmaspie Avenue he built a tennis court and summerhouse. The court was hired out for a shilling an hour and proved very popular in the late thirties. After the war social life in the area had changed and the court fell into disuse. 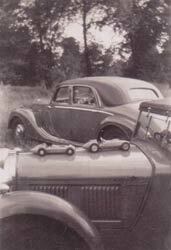 During 1946 his near neighbour C.E. Smith discussed with Mr Cull the possibility of running tethered cars on the court, and seeing the potential he agreed. 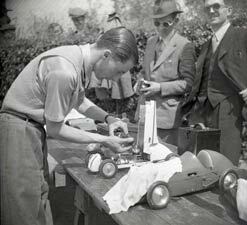 The Surrey Model Racing Car Club was now a ‘going’ concern and Smith took on the job of organising the track as well as becoming the club secretary. The tennis court already had a chain link fence on angle iron uprights surrounding it, with ‘stop boards’ at the bottom and a full height gate, so safety was not a problem and a 52ft diameter track was laid, which fitted neatly in to one half of the court. 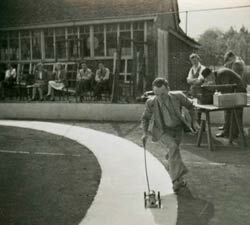 The track was ready and the inaugural meeting of the Surrey Club was held on 17th May 1947. The meeting was very well supported, with most of the ‘names’ competing, but it soon became apparent that the concrete circle that had been laid over the surface of the court was far from smooth. Many of the cars became airborne and the antics of the faster cars encouraged competitors to seek safety outside the cage. In the end reliability, rather than speed, paid off and C.E. Smith took the May Trophy at 44 mph. 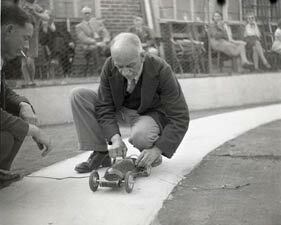 Those present were assured that the problems with the track would be addressed in time for the next meeting in June. 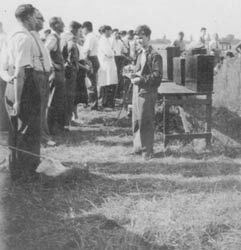 Interestingly, photographs of this meeting show the timekeepers, officials and others all by the trackside with nothing more than a few loose boards to protect their legs. The track proved very popular and several meetings and practice days were scheduled for the remainder of the season. Meetings were sponsored, with trophies and cash prizes, such as the ZN Trophy from E.P. Zere and the Rickard Trophy. Guy Rickard put up a lovely silver trophy to be competed for by combining points for a ‘councours’ judging, with speed attained on the track. The Surrey Club was functioning almost as the ‘outdoor’ division of the Pioneer Club and most competitors appeared regularly at both venues. 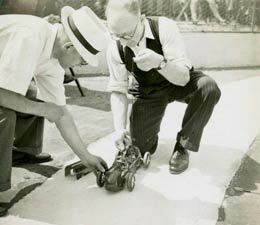 Model Cars was prompted to comment on the quality and variety of the cars parked in Christmaspie Avenue during the course of the meetings, and judging by the competitors, guests and interested parties, the whole operation was definitely one of ‘class’. The 1948 season got underway without the secretary who had travelled to America in connection with his work. The meetings continued to be very successful and thoroughly enjoyable social occasions, but there was a dark cloud on the horizon. The track was in the middle of a residential area and soon complaints about noise were being raised. Residents made representation to the Guildford Rural District Council about this problem and a planning restriction was imposed which restricted the number of meetings that could take place and further stipulated that they could only be held on Saturdays. 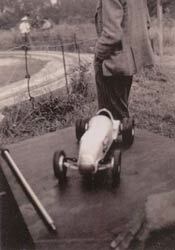 C.E Smith returned from America for the 1949 season and the track re-opened in February with regular practice days. This early start and frequency of use immediately prompted the residents to further action and to complain again to the Council, this time demanding that the track be shut down. The planning committee deliberated and recommended that as they had no evidence that the planning rules were being flouted the council could not act. It would seem that the Surrey Club decided to flaunt the rules as they were running meetings every week and sometimes twice a week. This was not going to be tenable and in August Mr W. Sewry, who lived nearby in Flexford Road sent a letter to the planning committee recording that the track had been used no less than 29 times between 17th February and 30th July and demanded that the council should now take action. The planning committee made a report on the matter to the full council in September and recommended that the council serve an enforcement notice on the landowner (Mr Cull) and the occupants (Surrey Club) that they must abide by the planning restrictions previously imposed. A further recommendation was that the council should negotiate with the landowner with a view to a voluntary cessation of model car racing on the land. 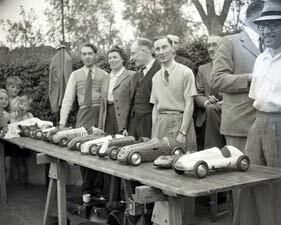 Late in September an announcement was made that "no model car racing would take place at Christmaspie after 1st October 1949". The last meeting at the track was to be the Anglo-Swedish match race, which took place on that very day. 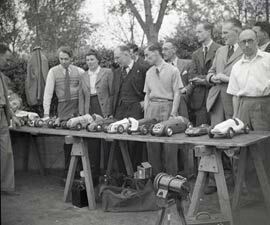 A very large crowd attended to watch the 16 cars compete, and in the end Britain won by just 1/2mph on aggregate speed. Guy Rickard was presented with one of four tankards for being the fastest Surrey Club member at the event. 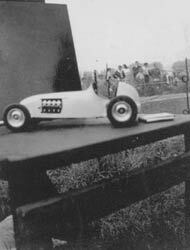 The Surrey Model Racing Car Club was now without a track and it appears that Guy Rickard ‘sold up’ and ceased his involvement with the Club. A small nucleus of Surrey members remained committed to the Club with Cyril Catchpole taking over as secretary from C.E. Smith while the search continued for a suitable site to build a track. After a great deal of effort by all concerned one of the members L.J. Mills discovered a site near Weybridge that might fit the bill. 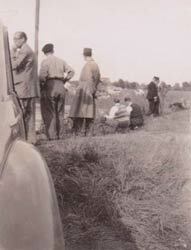 Chertsey Mead was just south of the Thames and had been an emergency landing ground during the second war. The concrete compass circle was still in existence and that would make an ideal track. Being agricultural land now, there were no problems with housing nearby, and following negotiation with the farmer, the Surrey Club had a new home. A great deal of work was involved in clearing the site and then laying a new running surface. Because of the parlous financial state of the club, the new surface was a just a thin concrete screed floated on to the original circle after thorough cleaning, described as "a back breaking and thankless task". All this effort revolved round the few remaining members of the club and by the summer of 1950 the 52ft dia. track was ready for a test run. Sadly this turned out to be less than successful as an unnoticed dip in the surface caused the faster cars to ‘buck’ alarmingly, risking both damage to the cars and danger to the competitors. A survey revealed that the foundation of the circle had sunk in places so there was no alternative but to break up the recently laid surface and put down a new 4" thick, level concrete track. Again the stalwarts set to work and by September the new track was ready for running again. All the efforts had been rewarded as the new surface was reckoned to be among the best in the country. Track laid on the compass circle of a WWII emergency landing ground. Steyr Allard 'Hill climb car' from the Snelling stable. 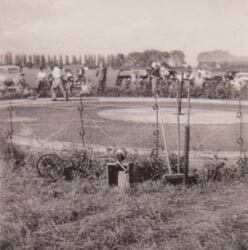 The 1951 season proved to be immensely successful for the Club and track as it attracted top competition from around the country as well as a new generation of enthusiasts who were going for broke, including the Olivers, the Snellings, Ed Rogers, Ken Robinson, Cyril Catchpole and Jim Dean. 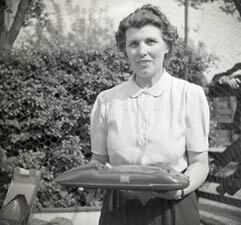 D. Garrod set a short lived record of 122mph in May, and two other British records were established during the course of the season. Such was the level of competition that now existed in the sport. 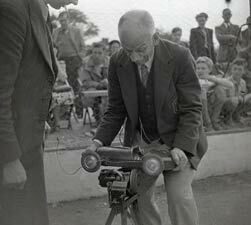 Early in 1952 Jim Dean became secretary when Cyril Catchpole turned his attention to revitalising the by now moribund Pioneer Club, transferring his activities to the full sized track at Edmonton. The major problem that faced the Surrey Club after the close of Christmaspie was the change in membership. 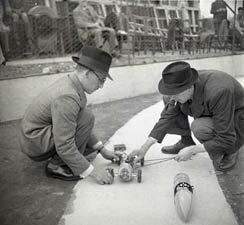 The enthusiasts that built the new track and kept the club running did not have the financial clout required to build a full sized track, which the level of competition was demanding and most of the competitors were allied to other clubs, leaving too few people to do the ‘hard work’. In June 1952, after just three meeting at Chertsey, the Surrey Club also transferred its activities to the Edmonton Club track at Picketts Lock. 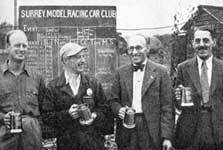 By the end of the year the Surrey Model Racing Car Club suffered the fate of so many other clubs and after 5 years of activity, faded from existence. Jim Dean became the most successful of the ex Surrey members and one of Britain’s leading racers, winning the European Championship in 53 and 54. Chertsey Mead is now a very pleasant open space, preserved because of the Thames flooding, which occurs regularly. The tennis court track at Christmaspie was abandoned, and in the early 70s the land, including the buildings to the rear of the courts, was cleared and four chalet bungalows were built on the site. Charlie Cull’s bungalow, workshops and yard still exist, as does C.E. Smith’s bungalow, now renamed ‘Applewood’. Thanks are due to the Normandy Historians for information relating to the track location. Thanks to Eric Offen for passing on images of Chertsey Mead, and to the Westbury Family for original images from Christmaspie.